London’s Delftware Potters: Who were they? How did they work? 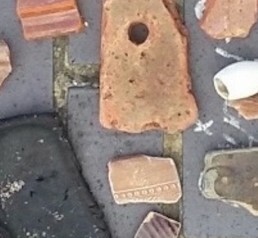 At this Clayground talk Mike Webber, Thames archaeologist, Roy Stephenson and Hazel Forsyth, Museum of London, will explore how the English Delftware riverside potteries played a significant role in London’s early industrial history. Between 17th-18th centuries, these London pothouses grew from small craft operations to mass producers of wares for domestic and international markets. 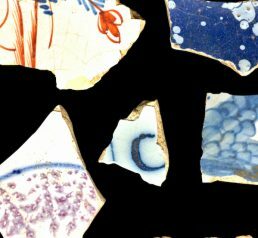 With the recent discovery on the Thames foreshore of ceramic material from the period, archaeologists are raising new questions about the English Delftware potteries’ expansion and decline. If you are interested in the history of craft, of London, of Lambeth, Southwark or Wapping, or have found ceramic fragments on the beach with Delftware’s distinctive blue and white hand-painted decoration, you will have much to learn from the evening. There is inspiration here too for practising artists and potters. In the potteries around Southwark Cathedral, specifically Montague Close, apprentices practised their ‘potter’s doodles’ on English Delftware bisque sherds rather than on expensive tin glaze. 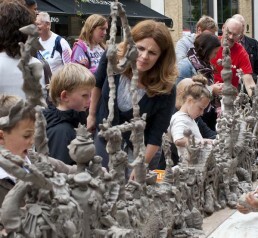 Come, make and decorate your own clay with master potters and create a temporary, large-scale clay sculpture. 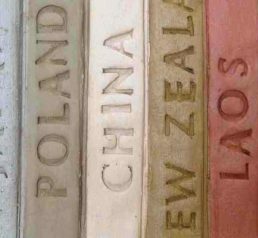 Two two-metre high towers are made for participants to add their clay disc-shaped stamped doodles, echoed in the walls of the knapped flint stones of the Cathedral. 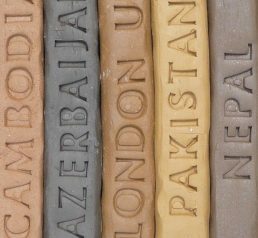 These events are part of London Craft Week.